Ionic liquids provide ion-rich media, which can control the system properties based on the size, charge, and shape of the ions. Owing to the versatility in their architecture, they can offer rare opportunities for designing smart materials which respond to external signals for specific applications. Polymerizing the ionic liquids can subtly arrange these mobile ions to control the material response. This is the basis of novel smart materials fabricated utilizing ionic liquids and particularly their corresponding ionic polymers. 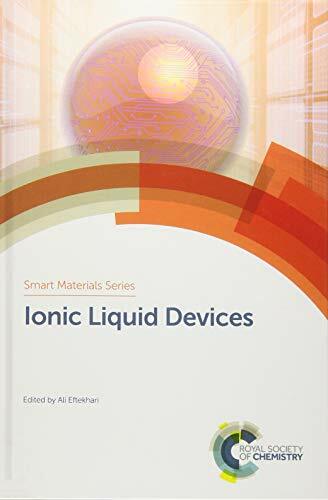 The two-volume set Smart Ionic Liquids provides the first overview of the applications of ionic liquids and their ionic polymers for the fabrication of smart devices. Volume one focusses on polymerized ionic liquids with the book introducing the polymerization of ionic liquids followed by individual chapters on different types of polymerized ionic liquids including nanoporous, cationic and anionic. Subsequent chapters then explore different material systems such as stimuli responsive smart fluids, thermoresponsive poly(ionic liquid)s and smart polymeric hydrogels. Volume two focusses on ionic liquid devices including characterisation techniques and their different applications as sensors, actuators, organic electronic devices, energy storage and nanocarriers for drug delivery. Written by leading researchers, the book provides a comprehensive resource aimed at researchers and students in materials science, polymer science, chemistry and physics interested in the materials and their applications. Ionic liquids are attractive because they offer versatility in the design of organic salts. As ion-rich media, ionic liquids can control the systems properties by tuning the size, charge, and shape of the composing ions. Whilst the focus has mainly been on the potential applications of ionic liquids as solvents, they also provide innovative opportunities for designing new systems and devices. Limitations from the high viscosity and expensive purification of the ionic liquids are also not a barrier for applications as devices. Written by leading authors, Ionic Liquid Devices introduces the innovative applications of ionic liquids. Whilst the first chapters focus on their characterization, which can be difficult in some instances, the rest of the book demonstrates how ionic liquids can play substantial roles in quite different systems from sensors and actuators to biomedical applications. The book provides a comprehensive resource aimed at researchers and students in materials science, polymer science, chemistry and physics interested in the materials and inspire the discovery of new applications of ionic liquids in smart devices.